The office space has many areas other than private offices and bullpens. Common areas such as, the conference rooms, break rooms, reception area, and copy rooms are an essential components of a functioning office. Copy rooms are commonly overlooked areas within an office. Copy rooms can function in many ways. Some functions are mail pick-up and delivery, presentation preparation, filing/organization, multi-function printers, and office supply storage. A multi-function printer provide the ability to print, copy, scan, fax, collate, binding, and document processing. Do not forget the copy room when considering your office requirements. A mailroom is where USPS, UPS, and FedEx parcels and packages are organized to be sent and received. A mailroom is common in larger offices, residential buildings, non-profits, and schools. Many buildings and offices employ a mailroom clerk to maintain organization for the incoming and outgoing mail. In the larger offices, a mailroom can function as a core of the mail system. 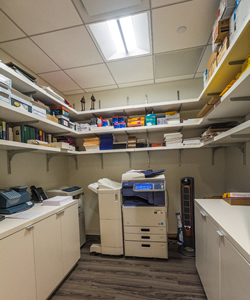 A mailroom is often combined with copy rooms or break rooms, to save on space. Adding cubbyhole mail slots, can easily combine mailrooms and other common areas. As with other technological advances, a mailroom has been digitized as well. A digital mailroom uses scanning and capturing to automate the mail. Paper and email can be organized in the same program allowing for a companywide standard. Storing digital copies of all parcels and packages eases distribution and storage. The archiving of mail and documents is required or requested by many companies. Corporate accountability and compliance has brought about more requirements foe information backup, storage (digital and paper), and other compliance standards. Even with the newer, more efficient automation equipment, the demands are high. This leaves most mailrooms to use the more basic methods. As technology advances forward, new methods are being developed and implemented. The reliance on paper has decreased and document processing/capturing has risen. The mailroom and copy room has changed and evolved. The importance, however, remains consistent and functional in an office. As technology advances forward, new methods are being developed and implemented. The reliance on paper has decreased and document processing/capturing has risen. 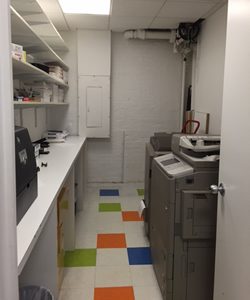 The mailroom and copy room has changed and evolved. The importance, however, remains consistent and functional in an office. If your in the market for an Office that features a Mail Room or contains some spare space that can be used as a Copy Room - we can help, just give us a call or fill out a form.